When I was at school, and I realise this very much dates me, we had chewing gum chainmail. Send a pack of chewing gum to the name on top of the list, add your own details at the bottom, pass the amended letter to 3 friends, and within X amount of weeks you will recieve X packs of chewing gum. People all over the world has heard of pyramid business schemes which exploit the same principel, as well as the Free Ipod schemes. It's all very well, unless your name is at the bottom of the list when the chain is broken. Don't you just hate it when you get chewing gum stuck to your shoe? Hey Sparkling, thanks for the info regarding Winfix site. I will investigate. Bye. Nah - I never did.... but I did use to chew Bazooka gum ..... great big pink globs that produced great bubbles back then. I think I'd get about 5 or 6 in my small mouth and then not have much room left to open my jaws and chew! 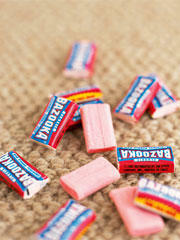 I used to love Bazooka gum when I was little. I would try to shove several pieces into my mouth at one time, until I could hardly chew. The stuff just doesn't taste the same anymore though. I just got a strange chain letter like that a couple of days ago. This one arrived with a scratch off lottery ticket. Which is why gums are banned in my country. Though it's not fun getting those gums off the shoe, chewing those grape and strawberry flavoured ones was good. Those tattoos transfers on the back of the gum wrappers brought back fond childhood memories.